Moving always brings adventure. Our much anticipated move is creeping closer and closer with each day and in 2 short weeks we will be in the throes of packing and loading and cleaning. It’s a good thing. In fact I think it is a very good thing. Chris and I have spent more time apart than together in the past year and even though his job will still involve a great deal of travel I am feeling so much better about being able to have a home base that will be a home base for hopefully a long time. We have had a crazy but wonderful journey the past few years. When we came back from Australia we were supposed to move to Tennessee. The house did not sell within the year we had it listed that time and the job focus shifted so it did not make sense to keep it listed to sell. We settled in. Then another job came along which meant a move to Texas. Fortunately the house did not sell in the short time we had it listed because Chris left that job for the current one. Had we sold the house the story would have played out much differently. The move to Alabama seemed inevitable and then after a lot of discussion and prayer and more discussion it was decided that we no longer needed to be in Alabama but just located close to an airport. We looked at beach property. We looked at more beach property. We finally came to the conclusion that we needed a “house house” to serve as home base. We always wanted to end up back in North Carolina and this was our chance. Our search got speeded up a bit because we got an offer on the house in Iowa before we had even started the search but it is all working out in a great way. Funny how that happens when you just let go and allow God to move. But the organizing and packing and sorting of things brings a lot of memories. Like when I opened a container and found these books. Some of my very favorite books to read to the boys when they were younger. The Cyndy Szekerers hardcover books were gifts from my good friend Mary Ellen who was my hospital roommate when we had Micah and Michael in 1985. I loved those books and so did the boys. We still quote “Puppy Too Small”. And how appropriate are the moving related books? Very. Memories come flooding back to me and all of them are ones that are wonderful ones centered around the boys and trips to the library and story time and sitting in my rocking chair that I am happily giving to a fellow North Iowa blogger to be used in his house as we no longer will have room for it. Those memories will always be a part of me – or at least I hope so. Sorting and organizing would go so much quicker if it weren’t for all of the memories that are triggered as I open yet another tote with things packed away to be examined before being repacked. But I would not trade it for the world. What are some of your fondest memories that have been triggered this week by something? Was it a picture? A book? A phone call? I would love to hear all about it. Please comment and remember Comments for a Cause this month supports Highland Youth Gardens. For me/us, since moving here 40+ yrs ago, a move would be totally overwhelming!!!! That’s why we’re so thankful that DS #2 (who lives just up the drive) has completed the purchase of our place and we’re now “squatters” ’til, as he says, we move “to the home”!!! LOL! BUT, having said that, we have many friends on the East Coast and will have another(!) so there WILL be a visit!!!!!! I am thrilled at how your next adventure is unfolding and know you will bless many in your new location!!!!! The Lord caused our paths to cross and for that I’m forever grateful!!!! Hugs…………………………….. The moving part is not as bad as it should be since we have packers who do the packing part of it. the most difficult part is leaving friends and familiar things BUT it gives me opportunity to make new ones, right? I am so glad our paths crsossed as well. We have so much in common and I always think of you when I see my sweet red and white quilt. Oh, by the way, I got my Mom’s Cathedral window quilt in June when I saw her. It is amazing!!! My great nephew and niece riding vintage tricycles on the Fourth of July brought back many childhood memories of riding trikes. Oh I bet! That would definitely trigger those memories to come flooding back. Thanks for sharing. saw my new granddaughter laugh the way just the way my daughter used to laugh when she was little…. good read! Thanks so much! I love that you saw your granddaughter laugh like your daughter! That would totally be a wonderful memory triggered! Thank YOU for stopping by! I’m the exact same way…cleaning, organizing, packing, whatever it is, I get distracted by boxes, pictures, etc.! I love reliving things, even if it was just a couple years ago! I’m so glad (selfishly) that you didn’t sell the house sooner and go to Texas because it means I got more time with you and I’m forever grateful for that! 🙂 Me, too. It was all part of the big plan, wasn’t it? God has perfect timing. It’s funny how objects hold so many memories and then it’s hard to give them away even though you hadn’t thought about them for years. I remember those books! Do you remember these books? That means you truly are my ‘daughter”!!! I loved them and have given them for baby gifts often. Finding those books – what a neat coincidence! I love it when those sort of “signs” turn up that reinforce you’re on the right path. Wishing you a safe, easy move! Thank you so much!!! It was serendipitous. Those memories certainly flooded in as I packed up to move overseas last year. Unpacking 6 months later brought more memories back. 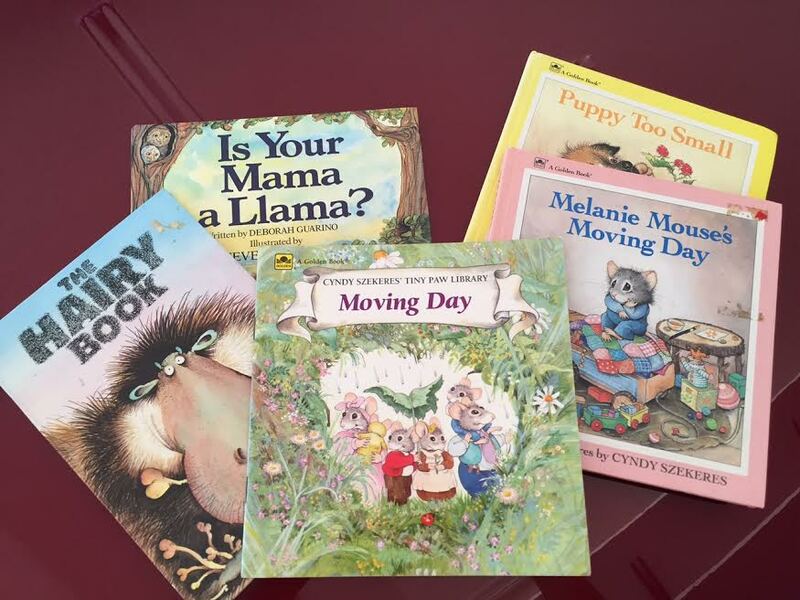 Those books are adorable and the moving ones so appropriate. Save them for the next generation. I am definitely saving them!!! “Is Your Mama a Llama?” brought back memories of reading “Llama Llama Red Pajama” when some of The Nephews were learning to read.